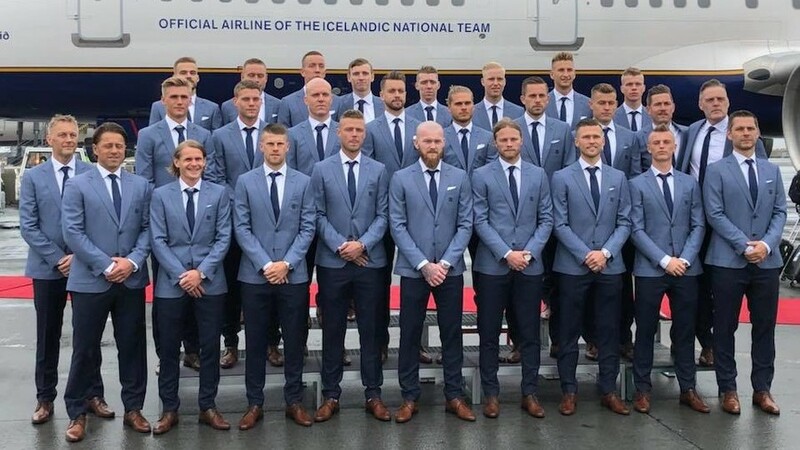 Football fans have poked fun on social media at Iceland's fashion sense, casually mocking the squad's suit and shoes combo upon the team's arrival in Russia ahead of the World Cup 2018 tournament. The World Cup first-timers were snapped setting off and arriving from the tiny island nation in cool laser-blue blazers and navy trousers, neatly finished with brown shoes. But not everyone was impressed with their attire, although most of the ribbing was light-hearted. I see Top Man have opened in Reykjavik. First stop The Slug and Lettuce! Iceland will be taking part in their first-ever World Cup finals after announcing themselves on the international football stage at Euro 2016, where they dumped England out of the tournament on their way to the quarter-finals, to the tune of their famous 'Thunder Clap'. Aside from the light-hearted taunts, most of the reaction to everyone's favorite hipster team came in the form of messages of support from around the world, particularly from fans from countries that didn't qualify for the tournament. 'The Vikings' face stiff competiton in their maiden World Cup having been drawn in the tournament's 'group of death' alongside Argentina, Nigeria and Croatia. They kick off their campaign against Lionel Messi and co. at Luzhniki Stadium on June 16. The team will complete their World Cup preparations at the Nadezhda Resort Complex in the Krasnodar region.